This Energy Management System is comprised of 5 Charts and 5 AromaVibrationals. Designed to help you help yourself and for you to help each other, the charts show certain points that when activated and released by the application of the specific AromaVibrational will create a shift and change in the energy field or aura and therefore a change in our experience of ourselves and the world around us. 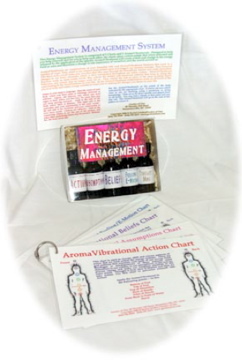 AromaVibrationals are combinations of pure Essential Oils and Flower/Vibrational Essences that work in a number of ways. First, smell is our deepest most primal sense and triggers our memory systems. Pure Essential Oils have such a small molecular structure that they pass through the blood/brain barrier and create immediate changes in our brain chemistry which is then transmitted throughout our entire system. Flower/Vibrational Essences work on more subtle levels, they release the mental and emotional patterns that keep us doing the behaviors and actions that no longer work for us. They release the root or cause of the issue or factor that�s contributing to the manifestations in your life. 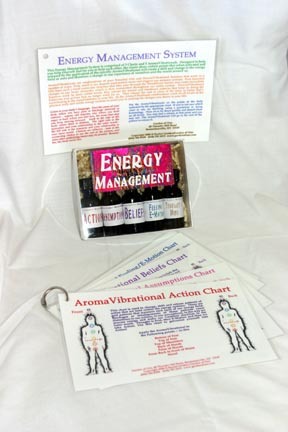 So the AromaVibrational combinations work on all levels of the physical body and subtle energy systems to assist you in making the changes you desire in your life. Put the AromaVibrationals on the points of the body indicated by the appropriate chart. If you�re not sure which chart to use, try dowsing, using a pendulum or doing kinesiology. Then sit or lie down quietly and absorb them on all levels. You may feel a release at that point and you may not. The AromaVibrational will go to the root of the pattern to release it. Listen to your body�s language. Find the areas of your body where you have pain or blockage (internal or external - organs, old injuries, etc), where you hold anger or hurt, where you feel fear, the areas that stop you from moving forward. Look to the side of the body where there is distress. The right side is the masculine and your relationship to the outer world - the left side is the feminine and your relationship to your inner world. Chakras are reflexive - look to the connecting chakra to see the rest of the picture, and what other underlying issues may be present. Remember, the body never lies.